Do you ever get tired of that comatose-like state your junior highers slip into as soon as you start your lesson time? We thought so, which is why we created these Active Bible Studies. Each lesson is based on a teachable passage, features clear lesson plans, fun activities that tie in to each lesson, discussion questions and more. It is truly a turnkey resource for when you need to include a Bible study for small groups, camp, meetings, retreats, or whatever else you program demands. 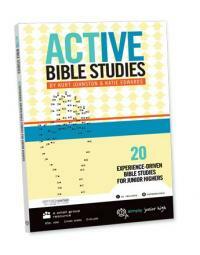 And each lesson is specifically designed to help junior highers apply God's word to everyday life. Armor of God Experiencing Time with God Get Below the Surface God's View vs.
the World's View [Girls Only] Local & Global Missions A Letter to the Philippians Shhhhh! The Power of Actions Over Words Board Game Once Upon a Parable A Not-So-Random Act of Kindness/li> Praying for One Another The Last Days of Jesus Encouragement Jar Power Up [Geared for Guys] Picture Perfect God's View vs.
the World's View [Guys Only] Grab Bag Becoming God's Girl Got Fruit? Spend It. Each lesson is editable and customizable, so you can use it “as is” or tear it apart and build your own monster from it!